Clean water plays a vital role in health and fitness. 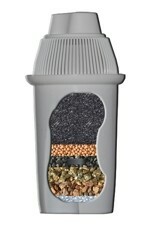 The Wellness Filter® offers you and your family a quality of water that Nature has provided to a select few. By using natural purification processes in combination with specialised minerals, the Wellness Filter® not only removes harmful contaminants but also enhances the water through a patented process, creating a quality of water beyond the reach of most conventional water filters. The Wellness Water Carafe gives you clean, refreshing water using a multi-stage filter cartridge to reduce Chlorine, Lead, and other harmful contaminants from your water. After the water is safely filtered, it then passes through Wellness' enhancement media, helping to structure the water for best absorption, and adding trace alkaline minerals to the water for a unique taste that can only be found with the Wellness Carafe. 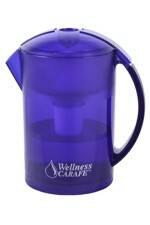 This Wellness Water Carafe Replacement Filter can be used with either the Wellness Carafe or a Brita filter jug. The Wellness Water filter gives you clean, refreshing water using a multi-stage filter cartridge to reduce Chlorine, Lead, and other harmful contaminants from your water. After the water is safely filtered, it then passes through Wellness' enhancement media, helping to structure the water for best absorption, and adding trace alkaline minerals to the water for a unique taste that can only be found with the Wellness Carafe.